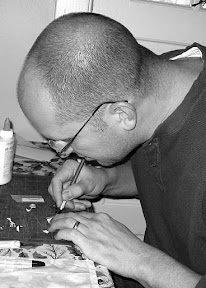 Welcome to the February WIP post and first challenge of the new Model Masterclass series. Kicking off the series, I tried to pick something that was deceptively simple. And that's it. There are no more rules to the challenge. We are both free to interpret the challenge however we see fit. The only thing we have to do this month is include some kind of bionics on the model. There's no way I'm building bionics. I should have thought about that before I sent the email out. Next time I'll slow down and think before I pick something cool and make sure it's practical. That means I'm getting bionics from somewhere. I decided on ordering some from Puppets War. They have some killer looking mechanical implants and weapons I'm planning on fitting onto my model in some way or another. They have a few options in their set so I'm not sure exactly what pose/weapon loadout I'm going to go with just yet. I think I'm going to load up my guy with as much "bionic" as I can and get rid of the human side. That's the only aspect I'm sure of right now. I'm going to add a few extra tubes and hoses as well to really seal the deal. 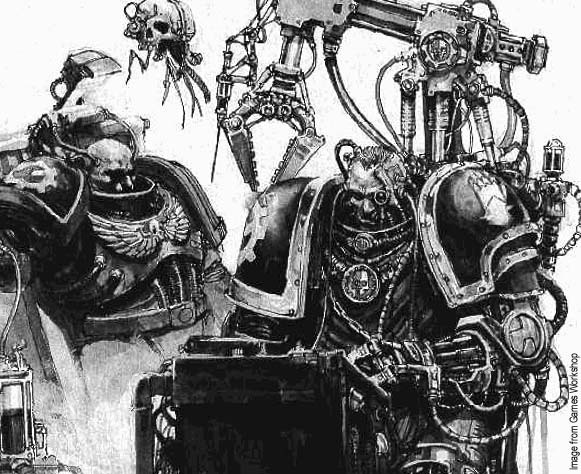 I've seen some Iron Hands art and I want to try and mimic some of the armour aspects I saw in there. My guy might be a regular troop, but I'm going to see just how unique I can make him. If you look at the art I have a pic of, I'm going to mimic his cut-away left shoulderpad if I can. I want to expose the bionics as much as possible. Since he's sporting black armour, I'm planning on putting him on a light colored, barren wasteland type base with some human bones. I think the barren base with some scattered human bones will make a nice contrast to the dark, mechanical marine I'm planning on building. I thought about covering the base completely with skulls and such, but I think it might look better with just one skull and a bone or two scattered about. Sort of a nod to his humanity that's gone now and replaced with bionics. When tasked with building up an Iron Hands Space Marine, or any other project, I like to do a little research for inspiration. I checked out their page at Lexicanum. I enjoy the background stuff and also like to see some cool artwork for inspiration. After reading up on them, I started to think of what I could add to a regular plastic marine model to add some tech and make the model uniquely Iron Hands along with being a cool looking model. 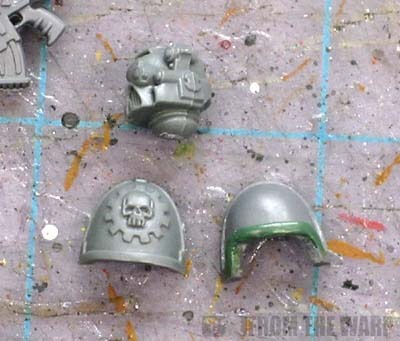 The main conversion stuff will be robotics, a gear shoulder pad detail and of course the hand chapter symbol detail also. 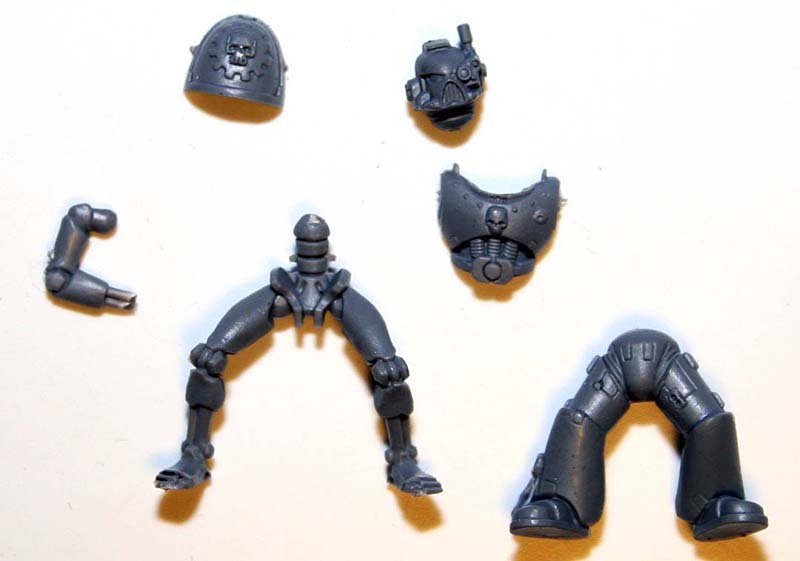 I'm not sure if I will use this particular marine torso or legs, but it shows how the Necron bits look in comparison. I will not use both legs, but will have to see which side I like the robotic leg on the model. The rest will be mostly basic marine bits, unless I dig up something interesting that fits or have a problem in assembly or some on the fly inspiration. I mocked up my bits to see what the model would look like. I kind of like the arm, and like the gear on the shoulder pad, as it will save me some tricky greenstuff work, but the leg is way to wimpy looking. I think if they made a robotic leg the size of a real one, they would have just put it into the normal space marine armor, and you wouldn't even notice. So I will have to come up with something more substantial and suitably "better" or improved over the normal marine size robotic limb.Back to the drawing board. A quick look at where John and I stand on this month. It's interesting to see the different approaches and yet how similar our takes on the same model are. In two weeks, we'll have some pics and discussion of the final models! Sounds like a great idea, I'm looking forward to seeing your different interpretations. It's interesting how something like this makes your 'creative brain' kick in to high gear, sorting through different ideas and approaches to achieve something original. Thanks for the link to Puppets War too! its a great first choice - simple on the surface but with lots of different approaches. 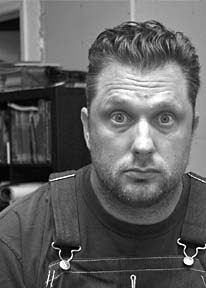 the unrealistic artist: Very true, just working one something outside your normal scope can have a huge impact on your work overall. Matt Farr: And he's in black armour so there are so many ways to go with the color alone. legoss: You don't see many Iron Hands out there. I could have gone with Black Templars and bionics, but I wanted it to fit better and for there to be a reason behind the bionics choice. So was it more about doing something black? Or was it bionics this time that pushes you? Because I've seen black, and metal stuff from both of you guys (I think) and I know neither one of you guys have any problems there. legoss: I'd say maybe more about the bionics since I don't incorporate them into models much. Tying that in would be the Iron Hands theme. Getting a good metal for the bionics vs. the rest of the metal on the model and so on keeping in mind the scheme is mostly black I thought might a little challenge. Wow Iron Hands, one of the rare SM army out there! Looking forward to see the result. Oooh, very cool. If I had a Tac Marine floating around unfinished I might actually give this a try. In the spirit of the post, though, I'll keep trying new things for the rest of the month. Can't wait to see how these turn out! hmm...iron hands, my first love =) I can not wait to see the end result! Faizal and Manufactorum: Two weeks and we post the results. Krisken: If you do try it out, let me know by email and I'll get your stuff added to the post. Sames goes for anyone else who wants to get in on this! who knows i may try one myself.maybe some bits from a necron for good luck? I'm hoping my bionics arrive soon so I can get to work on him. I don't want to wait until the last minute. I like the use of the necron leg; I used one to make a Vostroyan model for Straken -- a bit of a tough fit but I think it works. Looking forward to the finished products. 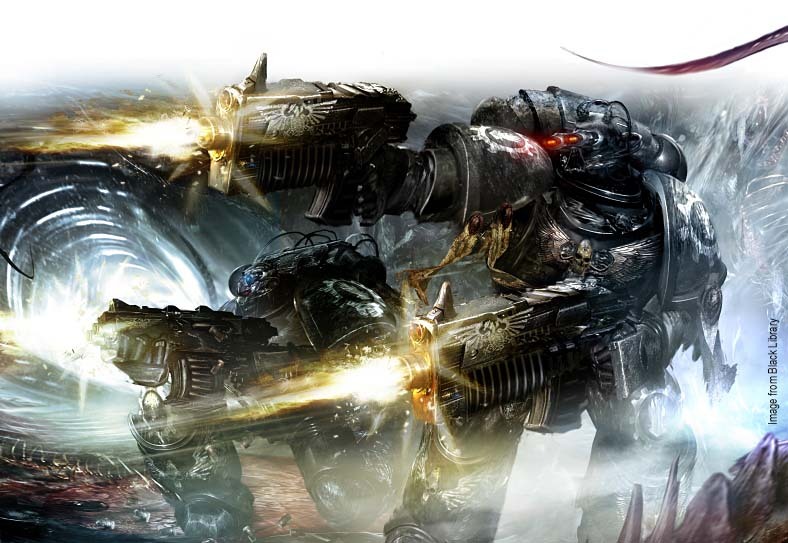 Ron, why don't you try the black colour scheme that Forgeworld used for the Raven Guard models on their site? Hudson: My bits finally arrived and I've spent the last day going through them trying to pick out the best combination for a nice effect. 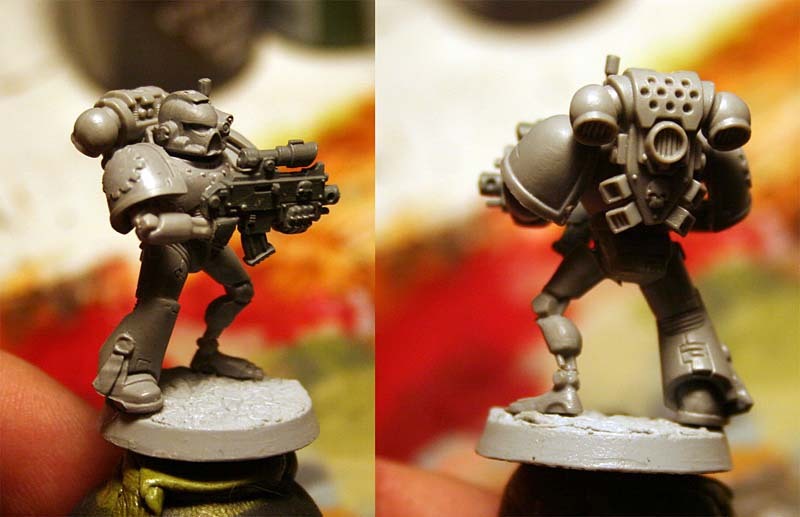 I think the Necron leg is a great idea for regular sized models (IG and humans), but I think it would have to bulked up a bit to fit in with Marines. John is going to have his work cut out for him, but I suspect he'll pull it off perfectly. Mortemer: Do you have a link to that technique? I was planning on using the same technique I used on my Black Dragon Space Marine a few months ago. the technique is pretty easy. you basically airbrush (or drybrush) black and instead of highlights you use wethering powders (in some places diluted with water). afterwards you pzint the details. imo, it gives a more relistic battleweary look...but whatever you like. I just proposed it cause you haven't used this technique yet. Mortemer: I actually haven't tried the weathering powders/diluted with water technique yet. I might give it a go to see what I can pull off on this model. It can be tough to get a light colored dusty look to models sometimes. I guess I have my work cut out for me now as well.